Dandie is available for deposit and will ready to join his new forever family around March 29th. He is a stunning red and white parti imperial sized Shih Tzu, currently tracking 7-8 lbs at maturity. Parents are Gena 6.5 lb red/white parti and Brent 7 lb red. I just can't put into words how thrilled I am with Dandie and his littermates. Absolutely gorgeous babies with outstanding personalities! Dandie is such a happy and playful little boy, and also very affectionate and loving. His beautiful red and white coat is shiny and soft. 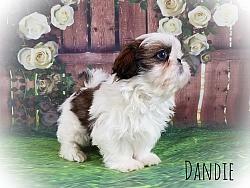 He has bright expressive eyes, high-set nose and tight muzzle. Dandie has excellent bone structure and a nicely proportioned build. Dandie is hand-raised and well-cared for in a clean, healthy environment, with lots of love and attention daily. 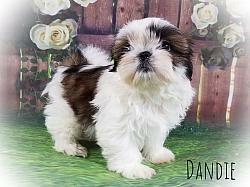 I am an experienced breeder providing quality Shih Tzu pups to loving pet homes for over 10 years. 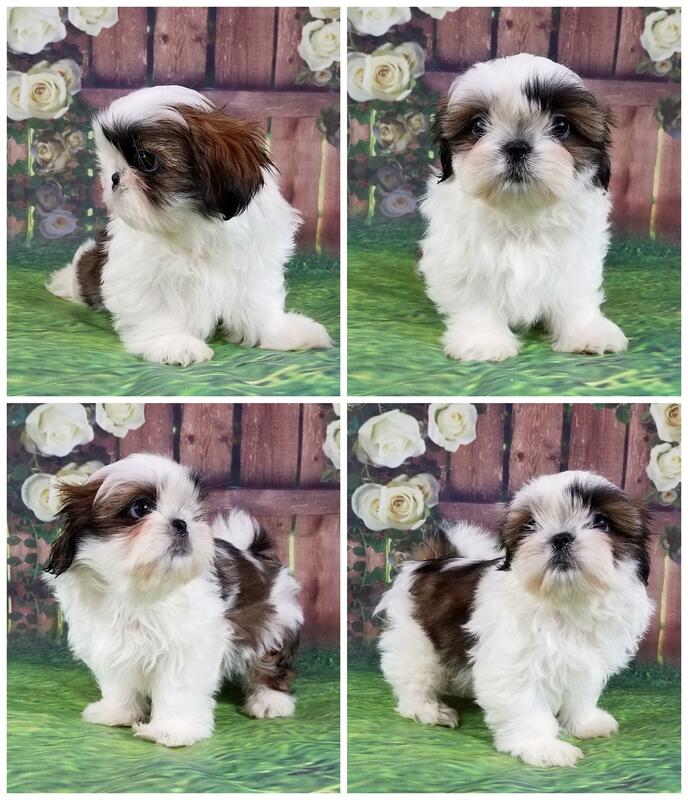 I take an extreme amount of pride in my puppies, and do the best to provide healthy, happy, and beautiful well-adjusted Shih Tzu. All my pups are well socialized by me and my family. 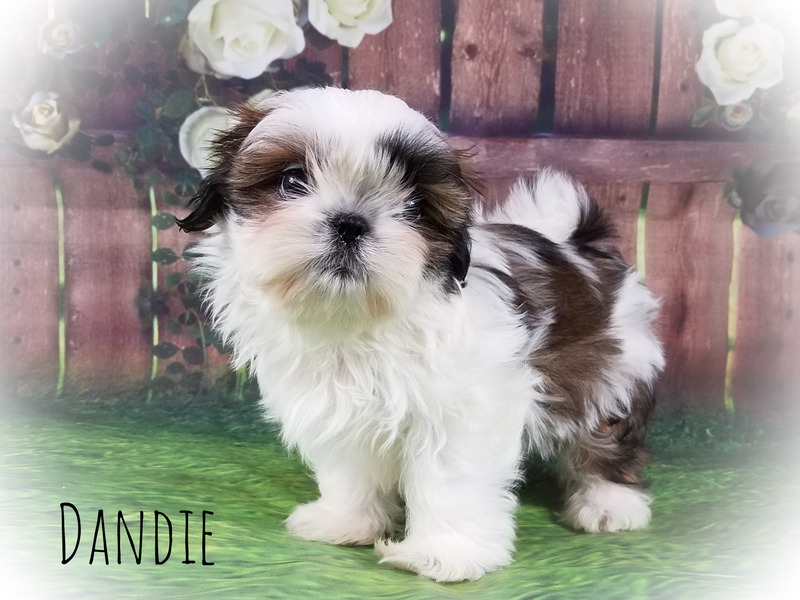 Dandie will be current on age appropriate vaccines, given all of the necessary preventative de-wormings, thoroughly examined by my veterinarian and cleared for good health, and will come to you with a detailed health record, veterinarian report and 2 year written health guarantee. My puppies also go to their new homes with puppy food, nutrition information, favorite toy, snuggle blanket with scent of mom and littermates, and 24/7 support. I am an experienced breeder and I'm always available to answer any questions or concerns you may have. Deposit of $300 will reserve Dandie until he is ready to meet his new loving family and transition into his forever home. Balance is due in CASH ONLY on pick-up day. Due to the fraudulent activity that can be associated with money orders, cashiers checks and personal checks, I cannot accept them as a form of payment. PET price means you will NOT received breeding or showing rights. Dandie is being offered for sale WITHOUT registration papers. AKC registration papers are available for an additional fee. 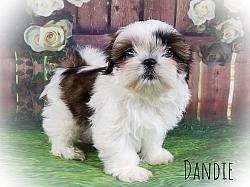 Please Contact Me if you are interested in making Dandie a part of your family.